…a stop at Breads Bakery, en route home, was do or die necessity. Heading to Union Square, the car is packed with Wizard, his crate, suitcases and one too many shoes to suit my every whim, occasion and multiple moods of the NYC weather. I ended up wearing one pair 24/7. What some call the ugliest shoes ever. To add insult to injury, I heard on the radio that very same weekend that it's the ugliest shoe out there. As if I needed a reminder and some scolding for my fashion misgivings. Sorry NYC, I know I committed a fashion faux pas, but the Crocs are super comfortable while giving me the necessary lift, from my barely 61 inches. I jumped out of the car while Jonathan nonchalantly sailed, our soccer mom mini van, into the curb side slot in front of Breads Bakery. I am not sure whether the spot was legal or not but that is where we had our picnic lunch. Not as romantic as it sounds, imagine howling in the background. 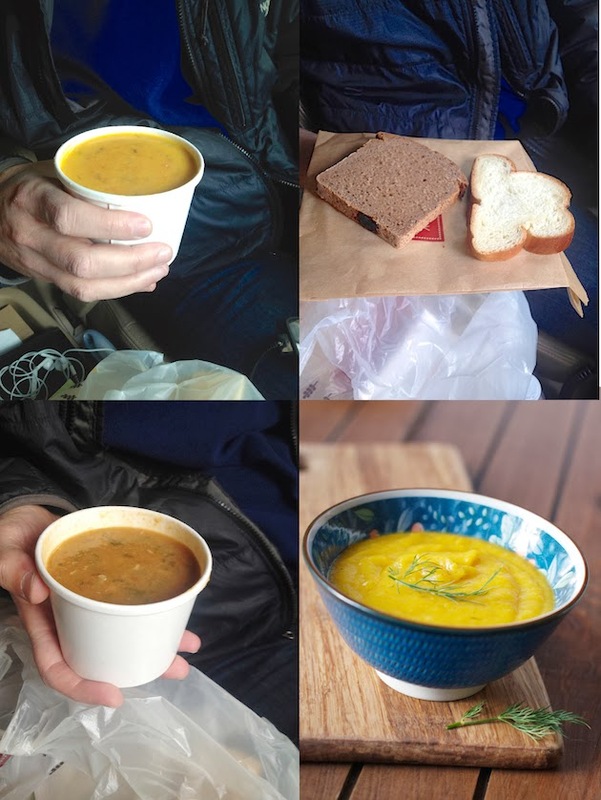 We shared a silky butternut soup and a hearty spicy Moroccan bean soup for lunch. The soups came with the slices of challah and wholewheat breads. Wizzy (Wizard), our beagle, who was doing NYC with us (and that's entirely a different, lord have mercy, story), enjoyed some Breads Bakery's scraps. We also couldn't leave without some savory pastries and a muesli bread for the road trip south. Early on on our trip back home, when we ran out of our Breads Bakery's stash, stuck in traffic with the rest of America on the Jersey turnpike, I was tempted to beg Jonathan to turn around and please, please head back. This soup here was inspired by Breads Bakery's rendition. Whether a duplicate or not, in my mind, I achieved the same exact flavor, consistency and color sensation. It was seasoned with what tasted like fresh dill. It was simple yet full of flavor. Creamy while I think it didn't have cream in it. 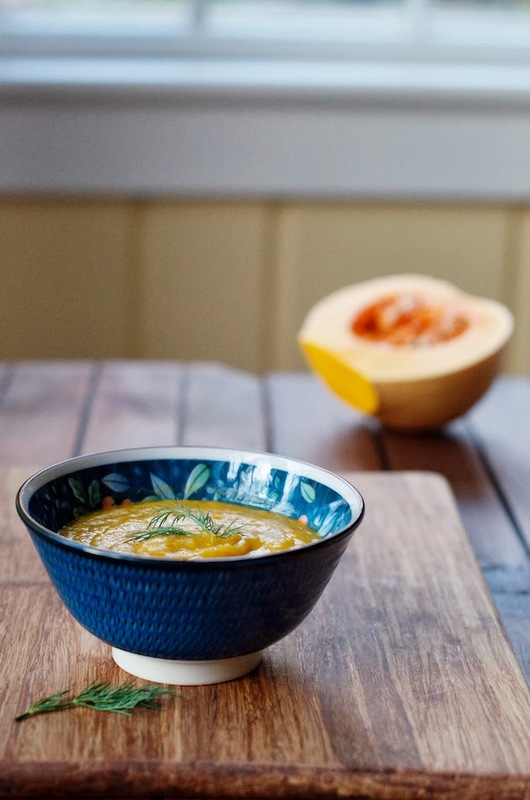 The beauty of this soup is that the butternut is so naturally sweet that you just balance it with a dash of salt to accentuate and pop the flavors. I don't think you even need the entire 1/2 teaspoon, top range of measurement, listed below. Add 1/4 teaspoon and adjust according to your taste buds. In a large pot heat up the oil on low/mediun heat. Add the onions, celery, carrots and garlic and sauté, while occasionally mixing, until vegetables are soft but not caramelized. 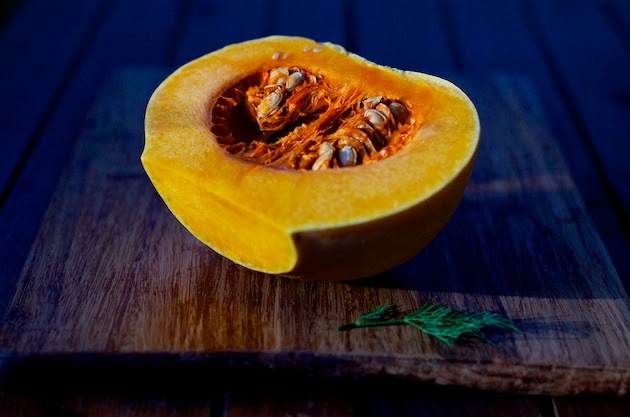 Add the butternut and potatoes, mix and sauté for approximately five minutes longer. Season with salt and pepper, cover with water and add the fresh dill. Bring to a boil and immediately turn down to low/medium heat. It should be on low bubble. Stir and cover with a lid. Cook, while occasionally stirring, until vegetables are fork tender for approximately 30 minutes. Best mash with an immersion blender for a creamier, more even consistency. You can also use a blender. A potato masher is ok too but the consistency will have more texture. Beware of hot soup splash while mashing. 1. If you wish the dill flavor to be more pronounced, add the leaves and mash the soup with the fresh dill when done cooking. If you wish for a more subtle dill flavor, add the whole sprigs directly into the soups or in a sachet. Discard the dill once the soup is fully cooked. 2. You need enough water to cover the vegetables and supplement if needed. If you like a more watery consistency please feel free to add more water. Leftovers will thicken the next day and might need to be diluted with some water. 3. You can use a vegetarian stock or a chicken based stock instead of water. 4. This soup freezes well. The top and bottom two photos were taken with my Nikon. Two top and bottom left photos in the collage were taken with my iPhone. Right bottom photo in the collage was taken with my Nikon. Jonathan is hand modeling and I must say he is mighty patient and his stillness is now so natural. Look at all four Nikon shots. The light is different in each one of them as the sun was sweeping in and out this past Saturday afternoon. A refined tasting and comforting soup! I love the fact that it contains dill. Sounds like you had a great trip, Shulie. Lovely soup! 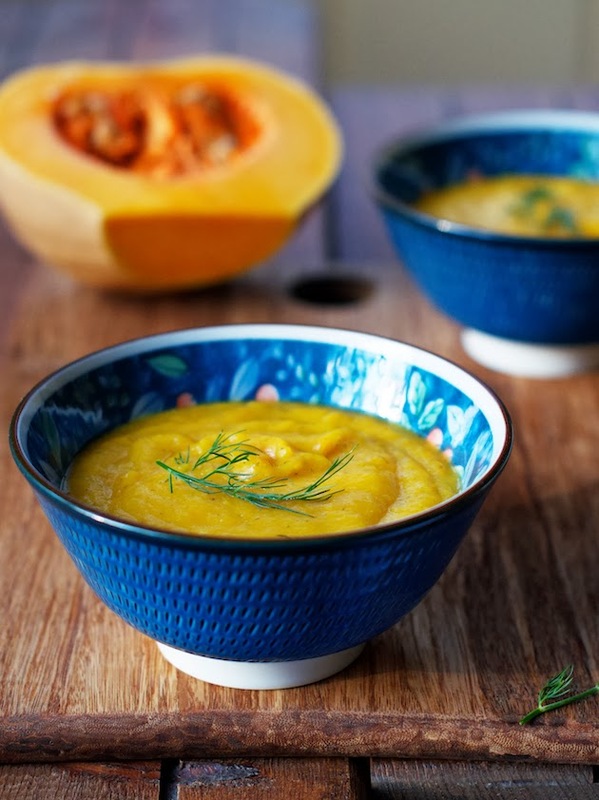 I love butternut soup & the fresh dill sounds wonderful hear. Glad you had a great trip!